We’re entering a new market with established competitors.How can we reposition our company and stand out in a way that is meaningful? SurePrep Learning, Inc.’s roots are in providing tutoring and test prep for underprivileged students throughout school districts in the West and Southwest. To diversify and increase its revenue base, SurePrep ventured into private tutoring and test preparation services, and as a result, entered a more competitive marketplace. SurePrep’s products and services were much better than its image let on, and management realized it was time to rebrand. SurePrep engaged phD to reposition the company in a changing market and against increased competition. Our charge was to re-envision the brand, from the logo and type and color systems to imagery and narrative voice and tone. 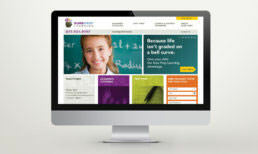 The brand had to appeal to a wide range of stakeholders from students to parents, and educators and administrators. We designed a brand identity that differentiated SurePrep in the marketplace and conveyed approachability and credibility. 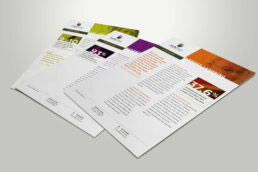 phD then extended the brand in print and online, reworking SurePrep’s collateral and website. We rolled out the brand to overwhelmingly positive feedback and marked increases in visibility and sales.